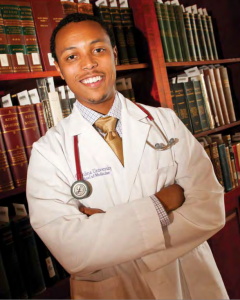 “At a very young age, I had an intense desire to become a part of the health care field. As a young child, I was exposed to many different types of doctors due to recurring minor health issues. These doctors, with their extremely different methods of interacting with their patients, sparked my interest in the medical field. There were some traits exhibited that I wanted to improve upon if I became a physician. There were others that I wholeheartedly wanted to emulate. Why? I thought they were the coolest doctors and I wanted to be just like them. My school counselors knew about my desire to become a doctor. They asked if I was interested in a program sponsored by Northwest AHEC—Preparing & Reaching in Science and Math (P.R.I.S.M.). Through my research about this program and others offered like Project S.E.A.R.C.H. Academy and Future leaders in Healthcare, I learned what it takes to master the infinite possibilities in the medical field and the ethical issues that are assumed when taking on this audacious task. Through my research about the various Northwest AHEC programs, I decided to become a pediatric surgeon. In my quest to attain my goal, I sought out other medical programs aimed at youth. From these programs, I gained greater skills and additional contacts for programs in the medical school community. When applying to college, I always kept my goal of medical school in the forefront. My love of science and mathematics lead me to North Carolina Agricultural &Technical State University, where a full scholarship enabled me to acquire a bachelor of science in chemical engineering degree. Keeping my ultimate goal in mind, I padded my class schedule with additional classes that would prepare me to take the MCAT and attended summer programs that prepared me for the rigor that I was intent on facing. The research opportunities that I experienced during my Northwest AHEC and other summer medical programs improved my resume and increased my chances of getting into the medical school of my choice. I chose East Carolina University Brody School of Medicine. Even at ECU, I quickly learned that the AHEC system was still a part of my life and aspirations. I took advantage of housing that was provided for medical students during rotations held at other health care facilities across the state.